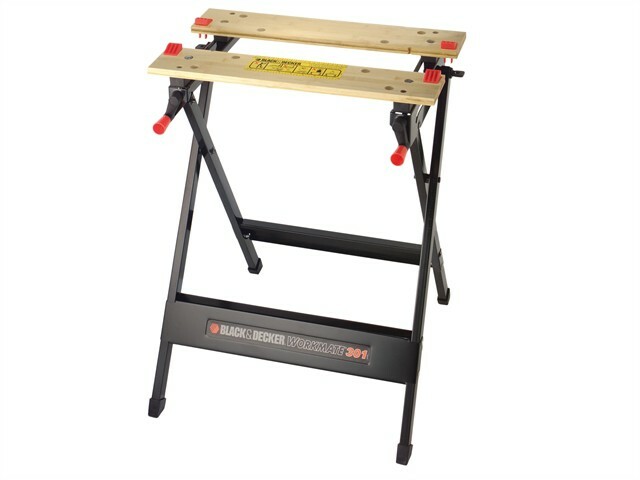 The Black & Decker WM301 Workmate Bench has a durable steel frame construction and folds flat for compact storage and easy transport. The dual clamping cranks increase the clamping force and offers versatility with the adjustable swivel pegs and jaw retention grooves provide clamping versatility and reliable material hold. It has been designed for easy set-up and clean-up with rubber feet which are anti-slip. Ideal for: holds virtually anything, bench tool stand, vice for cutting, painting etc. workbench and as a sawhorse. Vice Jaw Material: Compressed Bamboo. Vice Jaw Opening: 0 - 115mm.